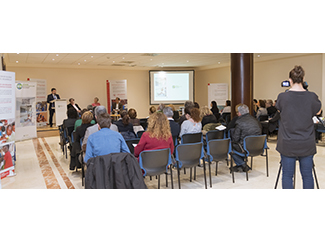 The Foundation has delivered this morning in the Auditorium Palacio de Congresos Príncipe Felipe de Oviedo of the VII Humana Textile Reuse Awards, within the framework of Humana Day Asturias. Ministry of Health of the Principality of Asturias. Health Area III. Prevention Service of the S. Agustín de Avilés Hospital. At the ceremony held this morning have participated as speakers Elisabeth Molnar, general director of Humana Fundación Pueblo para Pueblo, Román García, professor at the Open University and member of the board of the Institute of Studies for Peace and Cooperation, and Eduardo Gil, environmental consultant, writer and disseminator. 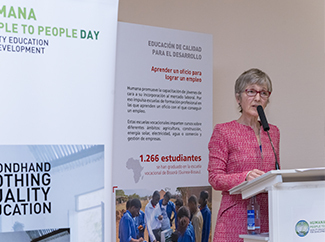 Elisabeth Molnar said that the will of the day has been "to show the extreme importance of promoting a quality education in those countries in the Southern Hemisphere in which we act." "We know that investing in quality, equitable and inclusive education has a direct and extremely positive impact on people's lives and progress. This impact should not be measured only from the economic point of view and wealth generation; It also has important cultural, social, and environmental implications, "he added. Eduardo Gil said: "The Spanish regulations establish that by 2020 50% of municipal waste must be collected selectively. In Asturias we are in the 23%, there is way to go. The key lies in separation at source and selective collection. " The environmental expert has insisted on the environmental and social benefit of reuse and recycling and added: "We should no longer talk about waste or waste but valuable resources that can not go to landfill. Recycling and reuse is not a matter reserved to the conservationist or ecologist movement, but is a necessity of common sense and a normative obligation. " 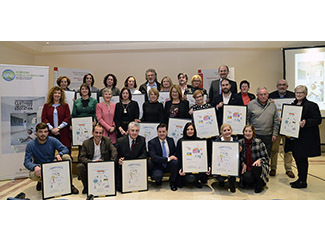 For his part, Román García stressed that "the amount that Humana allocates to development cooperation programs, with own funds, is similar to half of what the Government of the Principality of Asturias destines."